Great I bought counterfeit ****. Never again. However my car runs beautifully so far on them! Those guys that fixed mine did an amazing job! Thx again. I have bought 'fake' coils (N3H1 18 100B-9U) from a reputable seller in eBay Europe (I live in Turkey, neighbour to Europe) I paid $206 for 4 coils shipping included. When I got the package I noticed that shipping costed €15 which makes ~$20. That is, the cost of 1 coil is actually $46.50. In atkinsrotary.com it's $64, the least expensive one I found so far which I believe to be non-fake. I also had difficulty inserting the sockets into the coils. But they still fitted in. When I turned the ignition on, the engine started to run fine. And when drove a bit, I noticed the coils performed really ok. I could say , the engine now runs as brand new really but that doesn't stop me from worrying that I have fake coils in the engine. I wouldn't know that I had fake coils if I didn't come across this thread. After reading the posts and seeing the photos, I decided to take a look at the packaging of the fake coils and here is a comparsion with the package of a real genuine part. I think the picture speaks itself. Thank you for the comparison photo!!! If Revivo has more time, there are even more differences on the box. 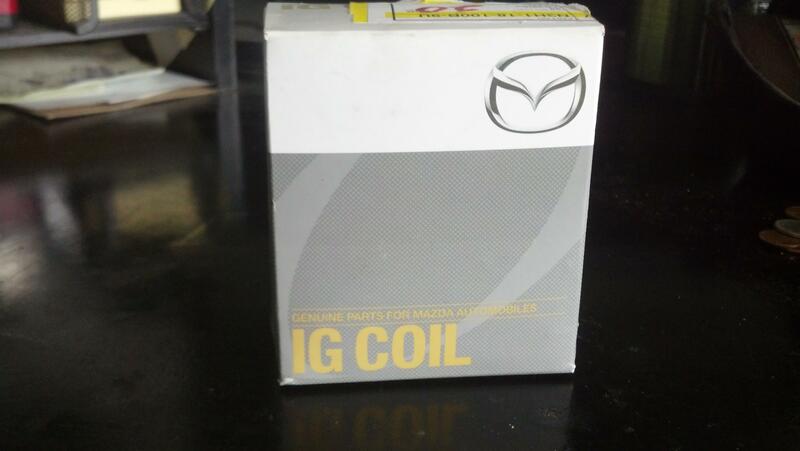 Where it says IG COIL, look at the shape of the letters. If you have time we would appreciate more comparison pictures, please . for some reason I feel guilty for taking a partial refund of the money, and reporting my case to Mazda. then again, I had to spend $600 to get my car back on the road, and i've hurt the already limited resale value of my RX8. Maybe i'm supposed to keep her foreeever. I would gladly add another comparison picture for the boxes but I can't as I don't have the box of a real genuine coil The original label you saw on the pic was from another part, put onto the the fake box. But I have another comparison picture taken from a different angle which shows another shortcoming of the fake part: Brittleness of the plastic. You see the crack on the left. It was broken when I got it out of the package. It must have broken because its plastic is more fragile than the original. And you see the socket seating line on the left is thicker than the original. Do'nt feel guilty.........you suffered from huge problems/costs imo. Last edited by Rudolph; 07-23-2013 at 04:59 PM. if you log out, and see where I say, "reporting my case to Mazda." there's a hyperlink to an ebay auction. When you log back in, the link disappears. Thanks to everyone who took the time to contribute to this post with various experiences and pictures. I have just been looking at ebay for coils and wires for the past few nights and would have probably bought a cheaper coil and wire set had I not seen this thread. After seeing all the damage the fake coils could cause, I think it is worth paying more for the real stuff. I will send a message to Mazmart to see how much it would cost to have them shipped to where I live. Thanks again for everyone's contributions to this and sorry for anyone who had to learn the lessons the hard way. thanks to everyone's help here! with all the help here, I'm hoping these knock offs get taken off the market! if they were these i couldn't tell the difference in how they mounted, fit the plug wires or snapped in the connectors. one problem i run into sometimes is the rubber sealing boot inside the OE connectors get squished due to misalignment, but having worked with like 50,000 connectors in my life i tend to appreciate paying attention to how a socket is mating together. wasting an hour fixing a connector for free is not my idea of a fun time. maybe this is the problem people are having, maybe not. but i still haven't had any issues with the aftermarket replacement units either. granted i did not put them under a microscope, they worked just fine. point here though is, if you're paying for OEM parts they should be OEM. i do know these are not Echlin products though, since Echlin uses brass inserts and has no part # stamps but a white painted part number on the opposite side as OEM, these do resemble the Airtex units though(airtex has used OE manufacturers in the past, but the construction isn't exact as originals. 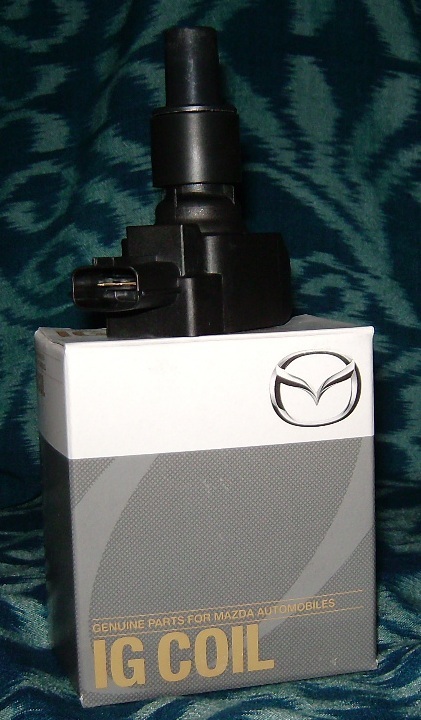 see RX8 fuel pump assemblies which have the OE label as well as their own). Last edited by Karack; 07-25-2013 at 11:44 AM. Karack (Ben)...i'm not exactly sure if they are oem, but so far so good, no major issues yet. I know you installed it correctly and professionally...thanks! Hello, yes the prices on your site are really the cheapest but the shipping 4 IG coils to my county costs about $115 (UPS WW Expedited)and that makes them almost as expensive as the ones in my country. Isn't there a way to send them more economically? Is the reason it is sent over UPS because they make the passing through the customs easier? Has anyone ordered these? Just wondering if these are legit? it seems like a good deal. In the past I bought 2 photocopied books from Amazon at 2 different shoppings. The $243 price of this set is almost equal to the lowest price of 4 OEM coils ($60 each). They also ship it to my country for $55. Such items are usually not shipped abroad. All of these make make me think that some items in this set are likely to be non-genuine. But it's best to ask the seller directly to be sure. ^ keep in mind that many of the legitimate sellers out there are selling the original revision of coils for far cheaper than OEM. Doesn't make them fraudulent. Just something to keep in mind. Well mine was an estimate based on the price tag and my previous experiences. BTW, I 've just ordered 4 coils at Amazon.com, but from a different seller named Avondale Mazda in Arizona. They offered reasonable prices for real OEM coils: $234+$80 shipping; $314 in total. If I was to buy that same coils in my country they would cost at least $480 so $314 is quite fine. Mmm, thanks. I need to find some cheap oem coils. (oxymoron) aha but im in the desperate need of a whole ignition replacement. Should i just start up with spark plugs ? then work my way up with coils. No, it's pointless to replace just part of it. A failing coil will cause misfires that will foul both plugs on that rotor. A fouled plug will increase the difficulty of discharge for the connected coil, and lead to accelerated coil failure for that coil. A weak plug wire will cause the same, in both directions. Just replace everything, all at once. Standard maintenance for this car. I will never get any of the "Genuine" stuff on ebay UNLESS I know the vendor, like Mazmart. Note I just replaced 12 coil packs for a local rx8 here with no issues, and they are all just BWD coils. and work just like stock and cost less. I can fix that. I ship USPS all the time. We will add our USPS links today. 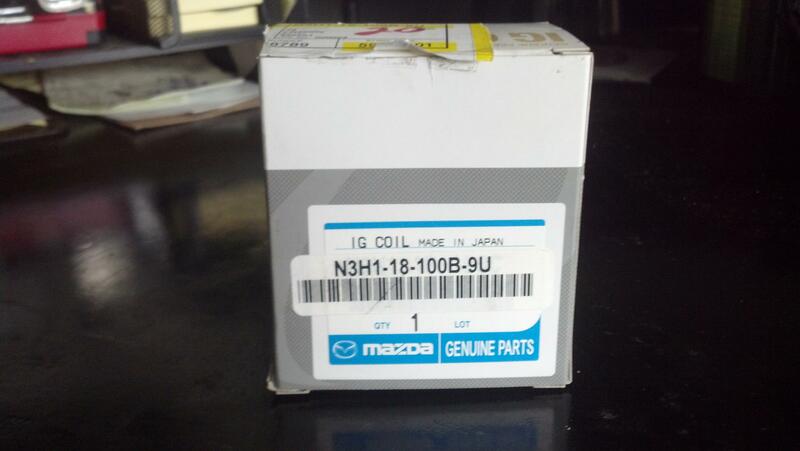 Remember the 9U part of the Part Number (on Box) is a Mazda USA thing only, it is their way (MNAO Parts) of identifying their bulk buying parts from MMC Japan (or supplier for other locally purchased but approved by MMC parts). 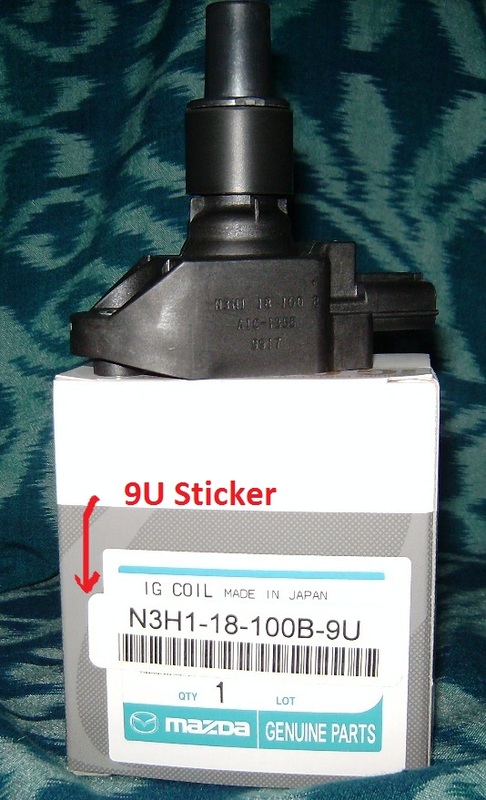 The B Coils I have are from Jason (Montgomery Mazda) and are from MNAO (Mazda Parts)....behind the '-9U sticker' is original MMC Part Number N3H1-18-100B, you can actually see the original number under sticker..(see pics). These are not knock offs they are just labeled with a MNAO own sticker Part Number Label (9U). Mazda Australia Parts has their own bulk purchase Part Number system also, the OEM number with (99) on the end. Anyway, yes, you can clearly see that the OEM Original Coils are almost perfectly formed and made, there are no marks or rough surfaces on the 'face' of the Coil. Plus the OEM Part Number N3H1 18 100 B is actually stamped into (concave) the side of each Coil, not printed on or missing altogether as some cheap knock offs. I only recommend using OEM Coils (always have), the B's and now C's are the best to use for easy OEM install, the only other one who stands by their product is BHR coil set, a great product but it should be...you get what you pay for. Recently I serviced a customer's 04, and found that it had one dead original coil. I let him borrow a good used coil I had, so he could drive the car until he bought replacements. He purchased new ones from Malloy Mazda and then sent me my coil back as agreed, as well as his 3 working original coils for me to have as spares. Ray mentioned something to him about the new ones from mazda being "improved" and that he should not have any problems with them, as the originals did. 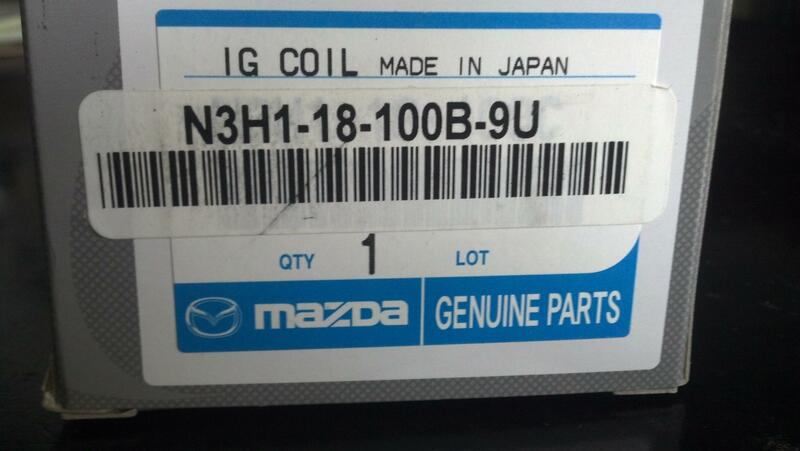 Here are some pics of one of the boxes that his new coils from mazda came in. I did not get to see the actual coils, as he installed them himself.